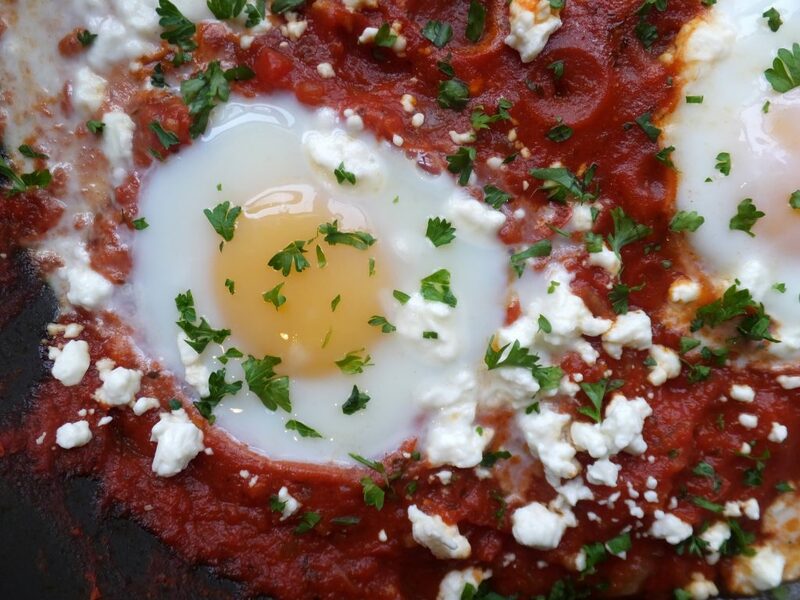 I’m assuming shakshuka is popular on the food blogosphere for the same reason many things are popular: it’s beautiful. 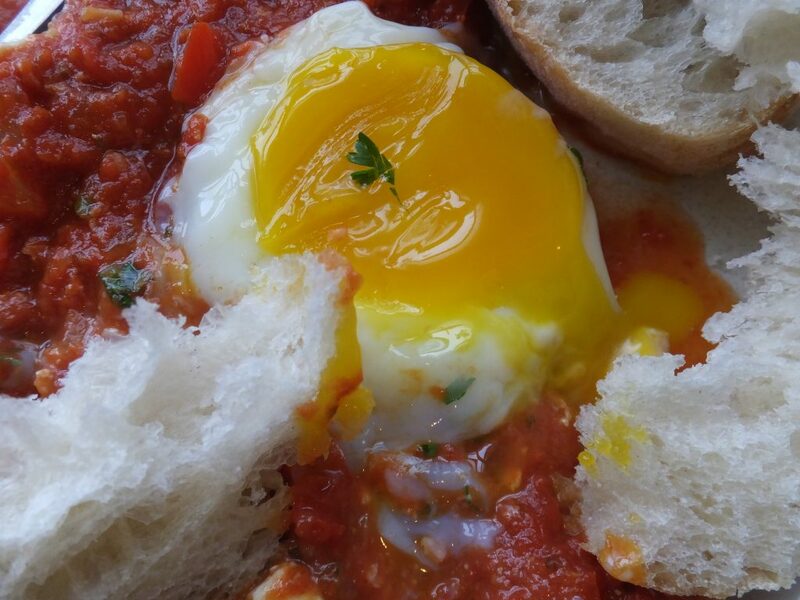 But unlike most beautiful things, shakshuka has substance. 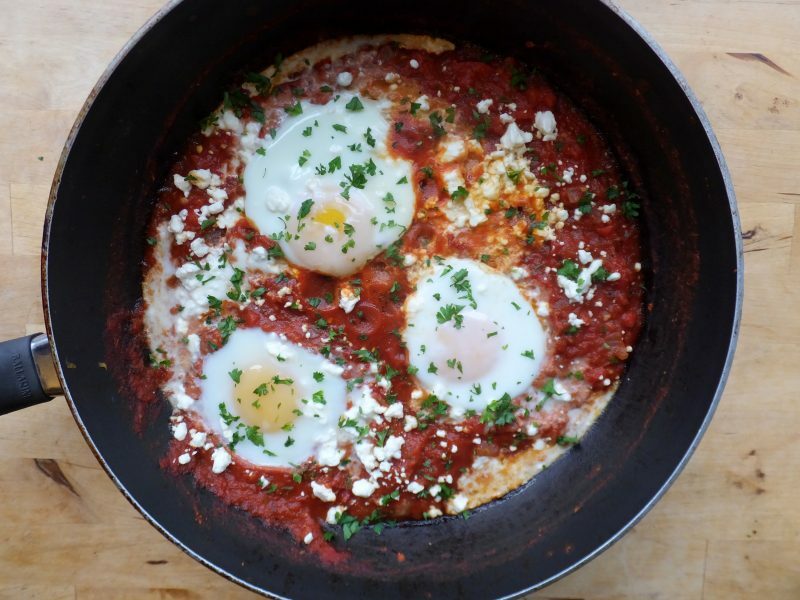 Of all the dishes I’ve made for this blog, this one is my favorite. No joke! I will be it adding to my normal rotation. It’s so easy, so delicious, and such a good excuse to buy a large loaf of ciabatta. You can adjust the spice level to your preferences or to the preferences of someone you want to impress. I would eat this meal at any time of the day, proving that eggs refuse to be held down by their breakfast label. When cooking with tomato sauce I recommend not to wear your business casuals. Just a touch of heat and it’s like someone pooped in the pool, everyone comes running out at the same time and onto your cardigan. Between this dish and the stuffed shells from last week I have an entire load of laundry to pretend doesn’t exist. Before making this recipe put on an apron or take off your clothes, both are equally good ways at preventing stains. 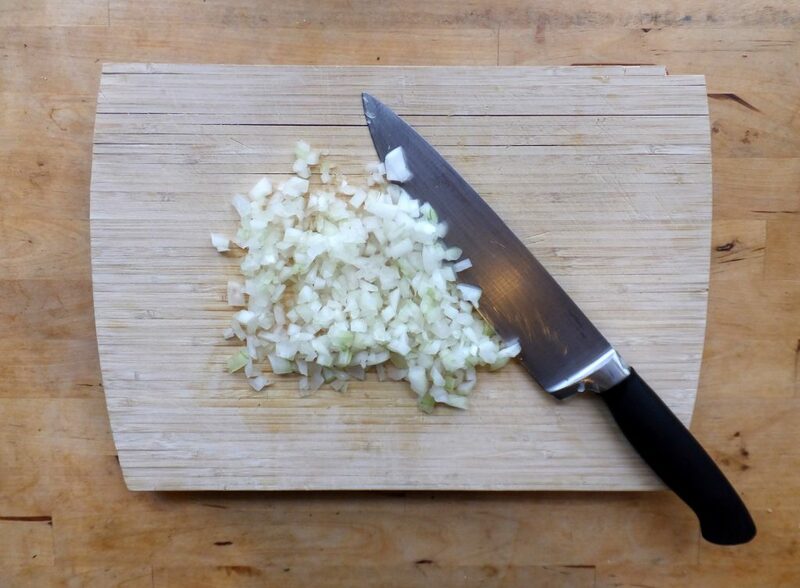 Chop up a small onion, or half of a large one, or 3/4 of a medium one, etc. 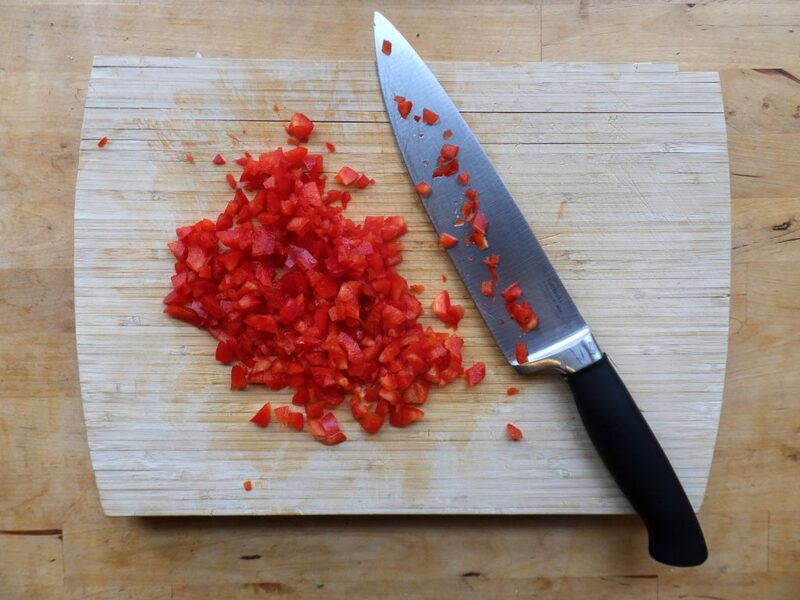 Chop up some red pepper. 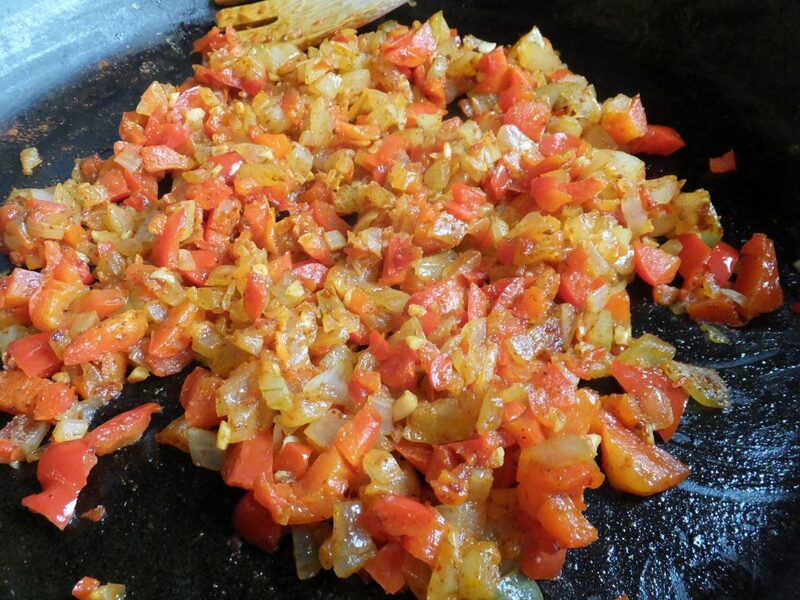 Saute the onion and pepper in oil until they soften. Really let them cook so the sauce doesn’t end up too crunchy. Add a tablespoon of garlic and then spice with cumin, paprika, and cayenne pepper. Cayenne pepper is not messing around, be aware. 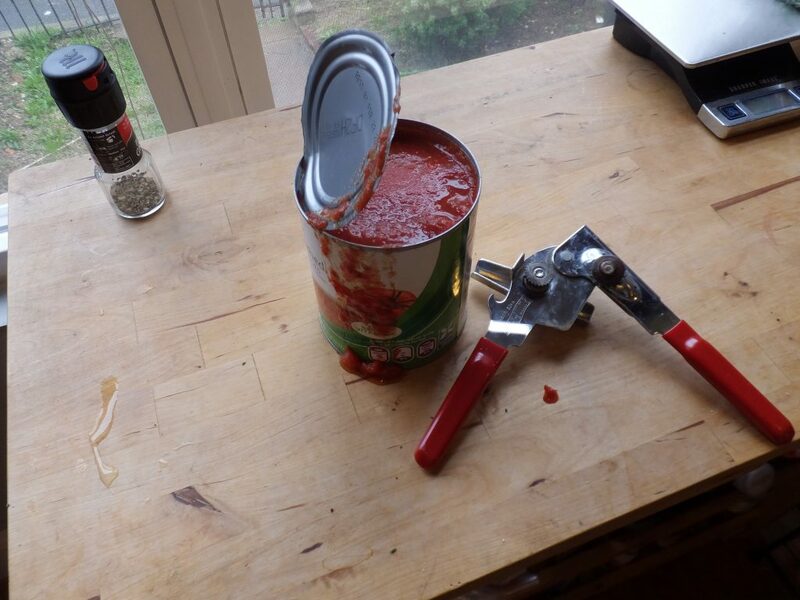 Opening this can of crushed tomatoes was a larger challenge than expected. Tomato juice, oil, and chunks were everywhere, most notably, on my clothing. 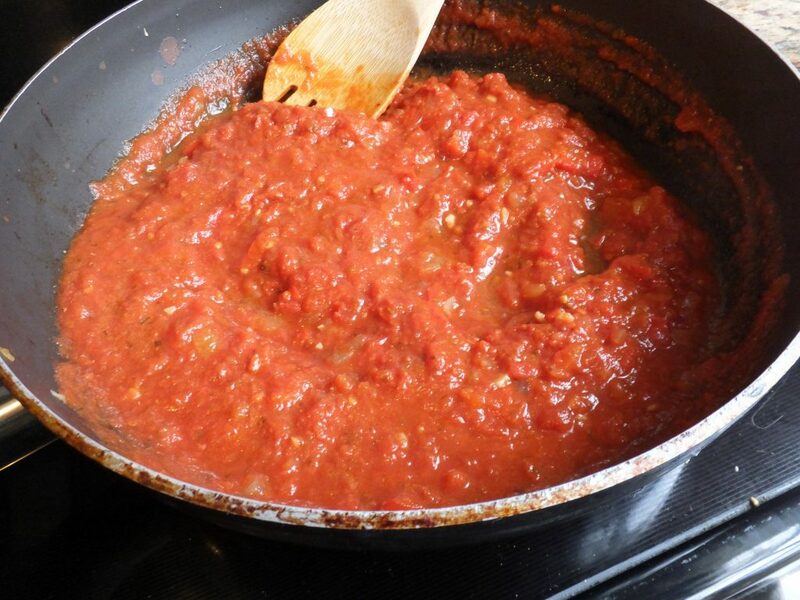 Once you’ve managed to get the tomatoes into the pot, let them simmer. If you want a thicker sauce, let the liquids cook off, but I recommend leaving it thin enough so your bread can soak up the juices. 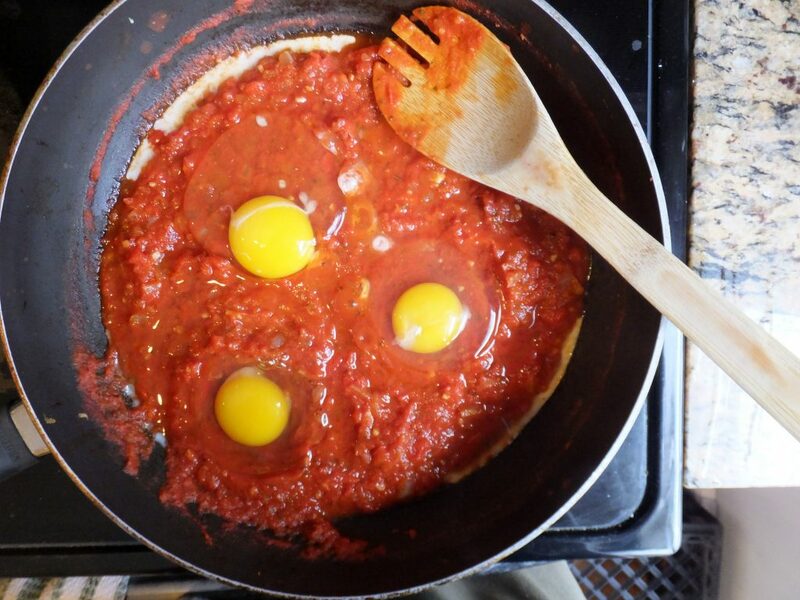 Once the sauce is ready, it’s time to drop in the eggs. 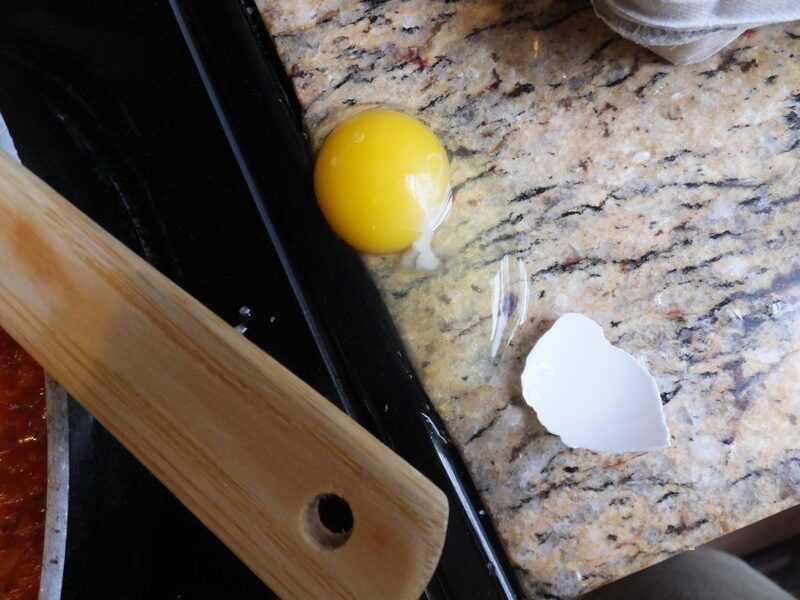 I gently tapped this egg against the counter and suddenly it was here. Not where I want it. Not in the sauce. 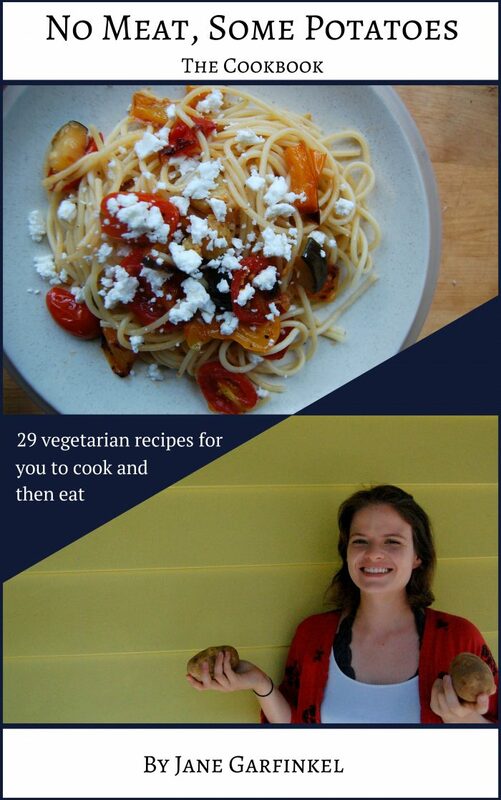 This would never happen to Giada. 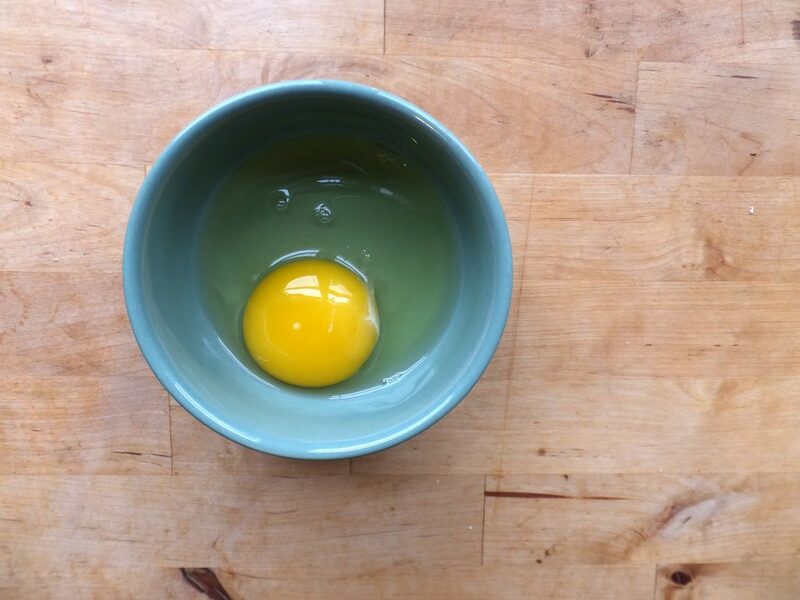 I didn’t want to take any more chances so I broke my eggs into this cute little bowl. A shocked, sun-burned man holding his hand to his forehead. Or this woman. 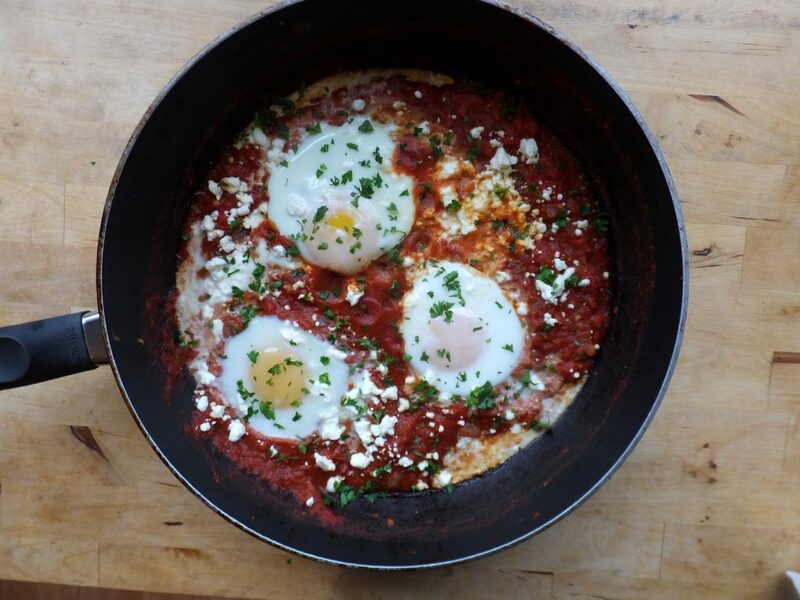 I recommend creating little shallows in the sauce in which your eggs can sit comfortably. This is also the time to add the feta. I was worried the salty cheese would be overpowering, but it wasn’t at all. You could also eat this with Greek yogurt, especially if you went too hard on the cayenne. 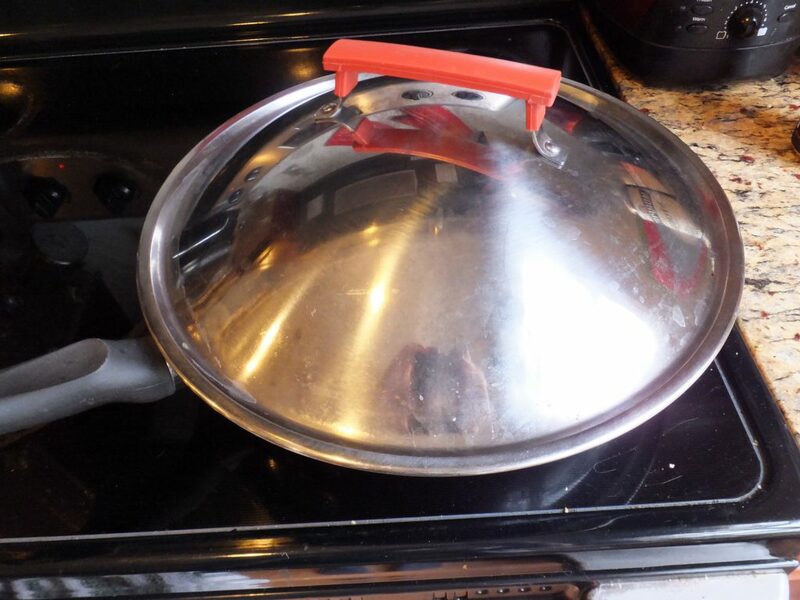 I wanted the eggs cooked but also runny, so I put a lid on for a 360 degree effect. 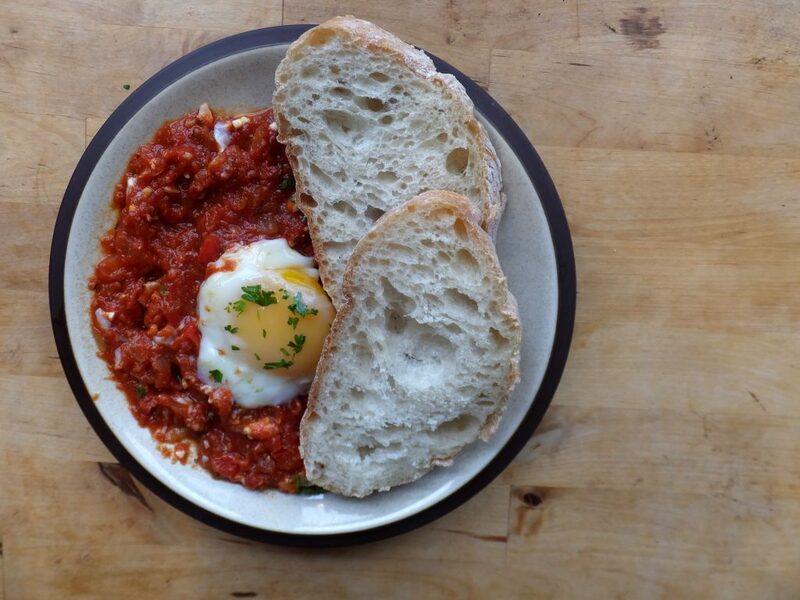 I garnished the shakshuka with parsley because god forbid there is a picture of food without random flecks of green on it. This is the prettiest, so revel in more photos than normal.